Aalayam - Colors, Cuisines and Cultures Inspired! : Home Tour- New Age India! Home Tour- New Age India! We are switching gears! After our virtual vacation to the Pacific Northwest, we are heading to Gurgaon, India's real estate Mecca, for a home tour! A sun dappled living room in merry colors! Some of you are probably already familiar with our home owner today because she is also a blogger! Meet Shalini Pereira of All Things Nice blog! On her blog, Shalini writes…. "Hi there! Here's a little about me and my blog... I'm an Interior Designer and Architectural consultant by profession and run my own design firm, SPDA. Besides design, I am passionate about cooking, reading, traveling and writing. In my spare time I like to read or cook up a storm! When I'm not doing either, I like to blog about design, my experiences as a designer or my experiments in the kitchen. I call my blog All Things Nice, because, well it’s basically about everything I think is nice!" I frequent Shalini's blog often. I like her blog. It is an easy read and she always has good literature accompanying her pictures. I also like how she draws attention to the architectural details in her home decor posts and I feel like I always learn something. The other day, I thought to myself "I wonder what her home looks like" and I wrote to her rather impulsively. And I am so glad I did because Shalini very graciously agreed to feature her beautiful home on Aalayam. 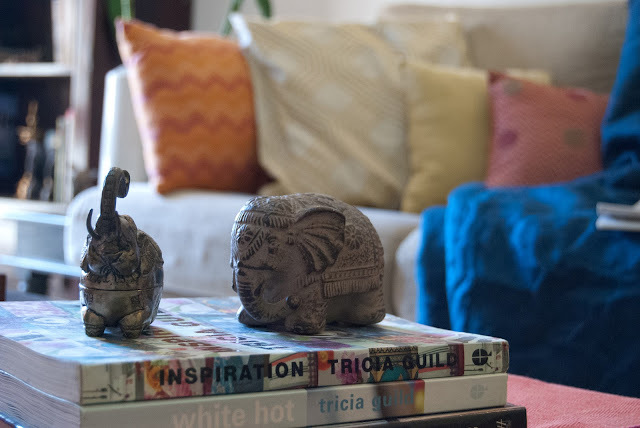 A pair of adorable elephants take centerstage on her coffee table- Shalini shares my love of elephants! 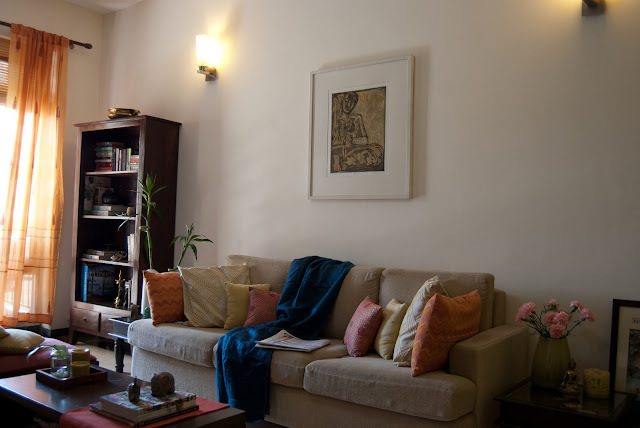 Shalini and her husband Abhishek live in a gorgeous home. When I saw the pictures, the immediate term that popped in my head was "New-Age India" and I am sticking with that. I think eclectic is so overrated, anyway! With a lot of ingenuity and diligence, they've converted their rental into a cozy and welcoming nest. In the main living/dining area, pops of vibrant hues merrily share the space with lighter shades and the whole ensemble is anchored together by a sublime olive green. It is a perfect retreat to spend a sunny Gurgaon afternoon. A room that speaks for itself!! Dressed in white and teal, the bedroom exudes a calming feel- just what the doctor ordered after a hard day's work! Shalini's professional acumen is evident in her harmonious use of interesting artwork, quirky curios and ethnic elements all in the same space for a cohesive pulled-together look! I love it! 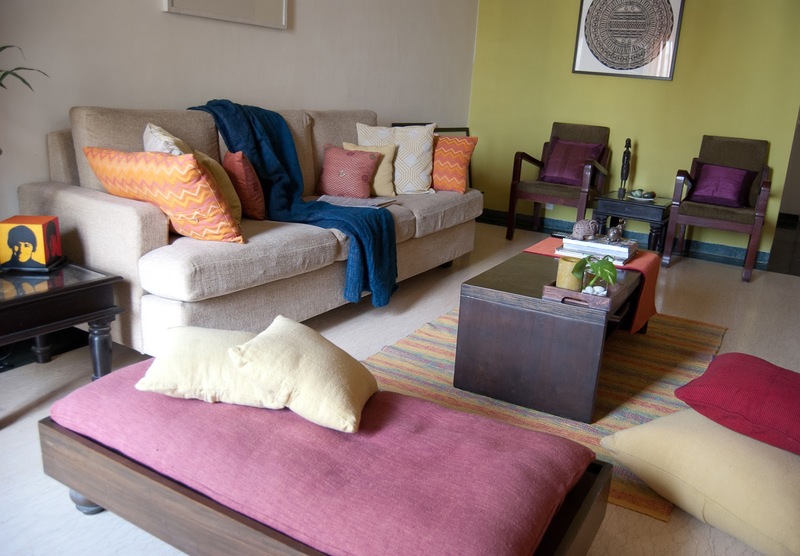 A modern space + traditional Indian elements + chic western touches = New-Age India! I think Shalini and Abhishek have nailed this look to a tee! Don't you think? Shalini and Abhishek's home is also a great lesson in creating a statement look with minimal but cleverly selected colors and accessories! Form meets function in this stylish space! Now, over to Shalini as she tells us more about how she has put a personal stamp on her place..
1) What makes your home "your home"? I try and surround myself with things I love, or that have some special significance to me. So, my home is full of knick knacks that I have collected over the years, it may be a small curio that I picked up while traveling, or a picture that marks an important moment in my family’s life. I’d like to think of my home as a happy place, where people are always welcome and I think that’s reflected in the use of colors, artwork and odd knick knacks. 2) Does the decor in your home fit the bill for any one particular style - if so, what drove you to that style? Firstly, we live in a rented apartment so it didn’t give us too much freedom in terms of really making it our own. If given the chance, there are several things I would change, such as the flooring- I would lay wooden floor boards over the dated marble flooring. Also the electrical fittings are not my favorite. But given the constraints, I am very happy with what we have done with the place, although it is still a work in progress. I don’t think that it fits perfectly into any particular style. 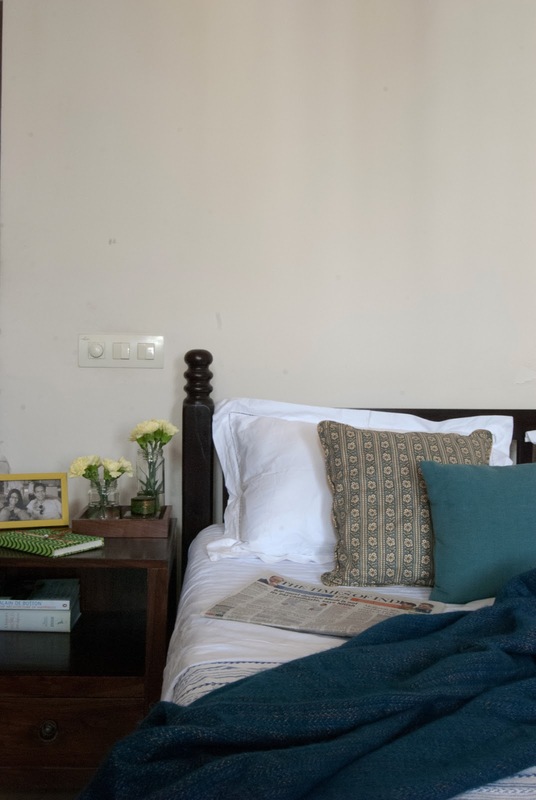 I could only try and describe it as eclectic, with a little touch of the contemporary, a little Indian, but mostly a casual, happy place with a laid back feel. Another view and equally beautiful! 3) Who calls the design shots in your home? I’m an interior designer and my husband is a management consultant who is also one of the least artistic people I know. In fact he thinks grey, beige, brown and cream are all the same! So I guess I call all the design shots. But both of us have contributed to the home with small D.I .Y projects. For example, my husband and I painted the green walls in the house over a weekend. Our next project is painting our dining table chairs which we intend to paint in different colors. 4) How does your personal decor style influence your work professionally? My personal decor style is very different from the homes I design for my clients. My home is casual and laid back, whereas most of my clients expect luxury, contemporary interiors that fit in with their lifestyle. I think my home will always be a work in progress, because it tells the story of our lives. The aged look on the side board/buffet adds interest and drama! 5) What are your favorite places to shop for your home? I don’t really have a particular place, but I do like FabIndia, Delhi Haat, Good Earth, Apartment 9. But I also get a lot of things from flea markets, craft fairs and local antique stores. 6) Where do you draw your online inspirations from - any favorite resources that you can share? I love Architectural Digest, Elle Decor, We Heart It, Home Trends Magazine, Archdaily to name just a few. 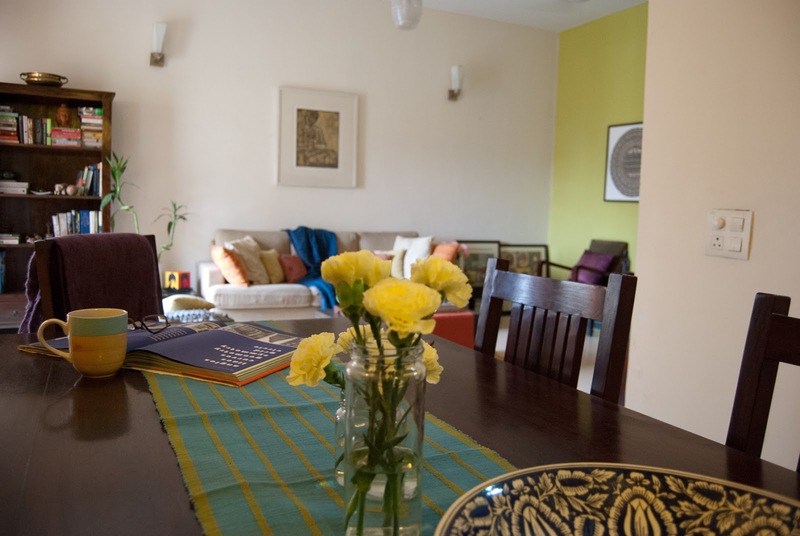 I love featuring home tours on Aalayam. I think real life home owners have such great insight into the home making process - it really allows you to put things in perspective. Home is where the heart is, after all! 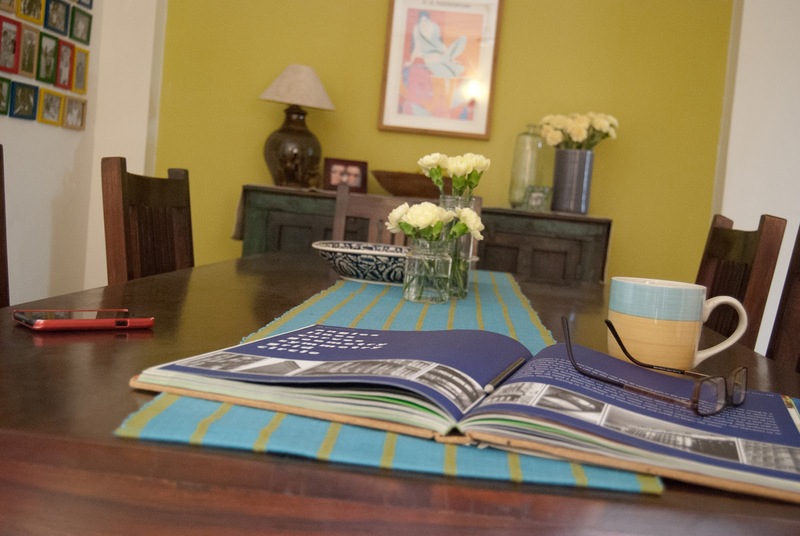 Thank you Shalini and Abhishek for sharing your charming home with us and the readers of Aalayam. Also, a special mention- Shalini's sister-in-law Ujwala Menon for capturing their home beautifully through her lens and making this photo tour possible. You can check out more of her work here. And you can always find Shalini here! Thank you Deepa for the wonderful write up! Love the way you've told our story. You've really captured the essence of what we were trying to achieve with our place. Love the term 'new age India'... Think I'll borrow that from you! Shalini: The pleasure was all mine! So, thank you! You can absolutely borrow the term! This is like the next chapter in Indian home decor, traditional elements like the brass lamp and urli playing peek-a-boo and sharing the space with accents that have a warhol-esque feel- totally New-Age! a big thank you, also to your family! Disha: Thanks for your comment. I am sure Shalini would appreciate that. I like her dining room too...stylish and functional! Shalini : Thank you! It was sooper fun collaborating with her and of course the grand prize is that we all get a peak at her lovely home! oops! that should've read *peek! Shalini...Its really a new age India....I liked he calmness in bedroom..kind of fuss free and warm dining room. Beautiful home!! nayana: thank you. shalini will aprreciate your kind words, i am sure! it is indeed a beautiful home! Vandana: Thank you. Through these collaborations, we also hope to introduce our readers to people, products, blogs that inspire us by telling their story. Indeed, Shalini's space is happy and happening! Thank you again for your comment. Supriya and I cherish our readers' input and interaction! Thank you for the mention and all the praise! Ujwala: Welcome to Aalayam and thank you for the pictures! If this is your cup of tea, then please join this site. Supriya and I have a lot of fun posts planned! Also, please spread the word to any design, decor, travel, culinary, culutre enthusiasts you know. Stunning. Enjoyed this home tour immensely. Thanks Anu! Shalinis's home is indeed a visual treat! Come back, looks like we are going to have a busy summer with a few more home tours! Absolute delight! I can stare at the ochre wall & dark wood for next few hours! Padmamanasa: Thanks for reading! Yes,wonderful imagery from shalini's home- magazine like! Nice color combination for any home.Nice thinking for home decoration.Thanks for this wonderful blogs and pics. The new age is really nice and interesting. Thanks for sharing. Good color combination used, like the lightening, Congrats! Wow! I absolutely love,love,love her home! 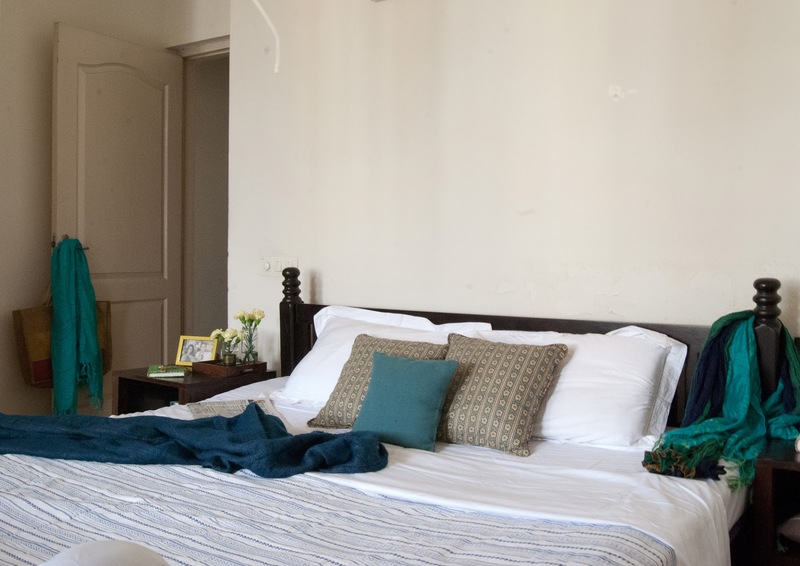 The antique accents, vintage attitude, collectibles, splash of colors makes it a purr-fect place to stay! There's warmth, coziness & a happy home feeling brimming in the room. 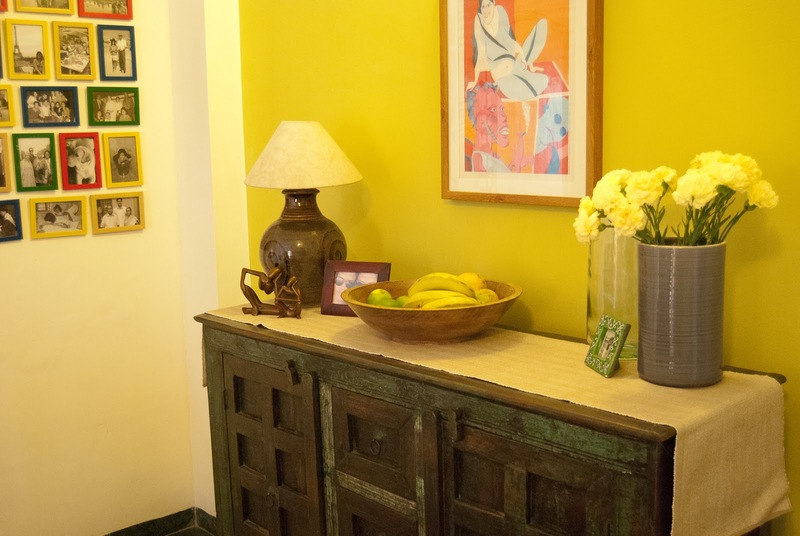 Highlights- the antique sideboard with a bright yellow burst on the wall & a beautiful photo collage. 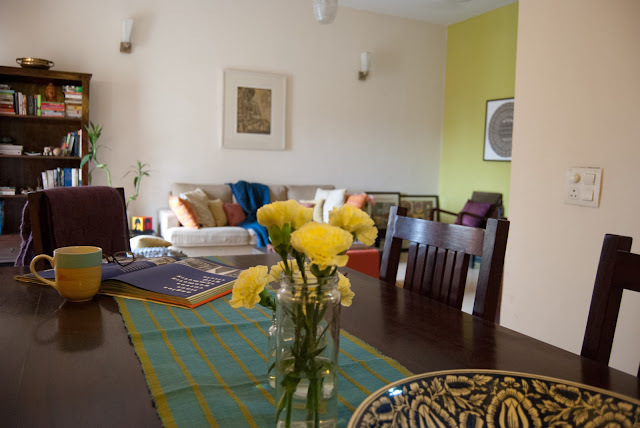 Another part equally beautiful is the dining area, with a bright runner on the table & the yellow flowers. Loved the way colors like yellow, teal, orange, purple have been used. The floor cushions adds that comfy feel to the drawing room and the dark wood furniture just very subtly adds the depth to the entire room. This is my first visit to this blog. I like it very much. I like the calmness in bedroom. Thanks for the time to share. Its really nice article.